Available in 12", 14", 16" 18", 20", and 24" diameter. Aerodynamic design and smooth corners minimize aire turbulence and optimize fan performance. Mounted in one piece, the hood is resistant to impacts caused by snowfall or icefall from the roof. It also prevents water and dirt infiltration in the walls. 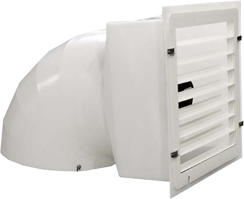 The hood outlet diameter is greater than the fan propeller diameter, allowing for unrestricted airflow through the hood. The hood outlet has been moved away from the wall 7 to 9 inches (depending on the model) to prevent dust and dirt from accumulating on the exterier lining of the building.